With the excitement of Christmas all but gone and everyone getting back in to the routine of work and school, there’s that inevitable sense of gloom. Here at Rockley however, we like to look on the brighter side of life and have a few suggestions to help you beat the January Blues! Whether you try just one or endeavour to do them all, we guarantee that you’ll gain some kind of satisfaction! With over 2 million people in the UK suffering from SAD (Seasonal Affective Disorder), it’s really important that we go outside! Being a watersports company, we could suggest sailing but even for most of us (well the less hard-core office staff), we’ll steer clear of the water until the temperature reaches at least 20 degrees! So, here’s what some of us have decided to embark on at the start of a new year with the hope that we will continue 2019 as we mean to go on. 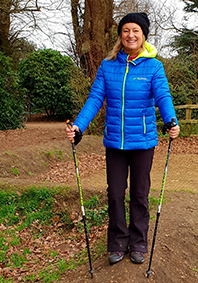 NORDIC WALKING; Val, our Finance Officer has just joined a Nordic Walking club and having recently kitted herself out with new walking boots and dare I say it, a bum bag, she is super excited at the prospect of meeting new people, visiting new places and keeping fit and healthy! SWIMMING; Our MD, Pip has recently joined the Branksome Chine Surf Lifesaving Club who meet up weekly. Despite her first session where she was told the first ten lengths was just the warm up and included butterfly (I mean who does butterfly and why?!) and their idea of a fun end to the exhausting one hour session were sprint races, she is very much relishing this new challenge. TRIATHLON; Others are really challenging themselves physically and mentally by training for a half iron man. Lis (Rockley Point’s Chief Instructor), Lucy (BTEC L3 Sport Administrator) and Alex (Development Officer) are braving the cold mornings and evenings with their endless running, cycling and swimming (the resounding least favoured discipline!) training sessions. A somewhat excessive way of burning off the Christmas calories but a massive good luck to them! STAND UP PADDLEBOARDING; If you really did want to take to the waters, why not follow mine and Jack’s lead and step on to a paddleboard. 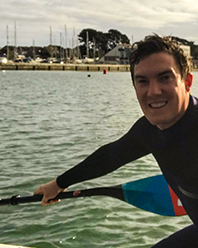 Yes I did feel like a ninja – head to toe in a wetsuit, gloves, boots a bobble hat and the rest, but on a beautiful New Year’s day in Poole Harbour where the water was like a mill pond, it was probably the most relaxing part of my Christmas holiday. It doesn’t matter what time of year it is, you really can paddleboard - a real stress relief and the perfect way to relax. Thank you to our other halves for a perfect non-prompted choice of Christmas present! Knowing that your holiday is safely booked is definitely an incentive to beat those January blues. So, may we suggest a fantastic family activity holiday to our AzuRivage centre in south west France. Unsurprisingly this holiday involves camping in our chalet style tents, access to amazing water activities, freshly prepared food each day and that all important thing that is time to spend with your family. If you’ve never been with us before, maybe it’s time to embrace change and give us a go – here’s what our customers said about their 2018 holiday with us. I don’t know about you but what I absolutely loved about my Christmas holiday was not having to sit at a computer screen for endless hours each day. Instead it was days spent on the beach, stomping through the New Forest, playing cards and losing drastically at Monopoly – worst board game EVER! In a world where technology seems to be taking up everyone’s time, both young and old, it really is important to promote healthy habits and it’s our responsibility as the older and wiser adult to instil this in to our children. So take some time out from your phone or tablet, give Alexa a day off and remind yourself that there’s greater reward in getting back to basics and enjoying the great outdoors rather than succumbing to the all-encompassing technology that surrounds us – at least for a day anyway. This week, as part of his school topic, my seven year old son had to dress up as someone from a country of his choice and bring in some food. Being half Irish, half Greek, I was hoping he’d go Greek so I could nip out and get some homous and pitta from the shops. Easy! Of course he chose Ireland (any excuse to go to school in his Ireland rugby shirt!) and we decided to make soda bread. Thirty minutes later, it was straight out of the oven and half of it was eaten with lashings of butter and jam. The four of us could have eaten the other half but then remembered why we made it in the first place! The following day, my daughter and I made another one. And tomorrow, Daisy and I will, yes, be making another one. With the chaos of school and Christmas, I haven’t baked with my children in ages and what fun it was! There is something so satisfying about baking something so lovely that it literally gets eaten within minutes of you baking it. I whole-heartedly recommend that you don your aprons and have some fun in the kitchen! Good luck to anyone attempting to combat the January Blues and we'll see you on theother side in February!